I hate, despise, detest, loathe (you get the picture) cleaning bathrooms. I would rather go to the dentist — I have a phobia of the dentist, by the way. The only thing I like about cleaning bathrooms, is having a clean bathroom once I’m done. It’s a conundrum… I hate dirty bathrooms, but hate cleaning them. Grin and bear it. Even if it is a gagulous job. Gagulous, you say, isn’t a word? Um, yes it is! I just added it to the Clorox ICK-TIONARY. It IS, or will soon be, an official word. You have to check out www.icktionary.com and see the words that other moms have come up with for the big messes in their lives. I have a strong stomach, thank goodness, but when it comes to cleaning bathrooms, toilets in particular, I get this horrible gag reflex. Hence, the term, “gagulous”. Even if a toilet is relatively clean, I feel gagulous cleaning it. Yuck! I mean, I know someone has to clean toilets, but does it really have to be me? My son laughs at me. That’s alright, you know what they say about payback. When he gets a bit older, it will be HIS job to clean all three of our bathrooms. We’ll see who gets the last laugh. Board-‘oeuvres – crumbs in your keyboard. I can relate to this because I have a bad habit of eating around my keyboard. Spillmanella – raw chicken juice from a marinade that spills on the floor. Okay, this one made me a little ‘gagulous’. Poopcaso – kid paints the wall with poop. I have a story about my sister when she was a baby that relates to this one. I’ll save it for another time. Or maybe she’ll pay me not to share it. Tee-Hee. I know you’ll get a kick out of these Mom (and Dad) made up words for life’s messes, and I’m sure you have a few you can add yourself. Because if you’re a parent, you’ve dealt with messes that would make the strongest of men cry. 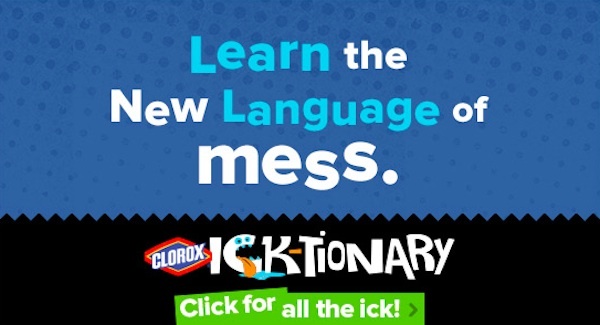 Check out www.ictionary.com and add your word to the Clorox Icktionary while it’s fresh on your mind. And be sure to “like” Clorox on Facebook. Okay, you’ve heard my new word for my life’s messes… do you have a word you’ve made up describing your life’s messes? We’d love to hear it! Oh, I’m also looking for someone who does toilets, if you’re interested in the job? Disclosure: This blog post is part of a paid SocialMoms and Clorox blogging program. The opinions and ideas expressed here are my own. To read more posts on this topic, click here. I am disclosing this in accordance with the Federal Trade Commission’s 16 CFR, Part 255: “Guides Concerning the Use of Endorsements and Testimonials in Advertising. You had me laughing over here because I was thinking about the times I had that same feeling cleaning my kids bathrooms and other crazy stuff they did when they were little. Keep the faith because there is a light at the end of the tunnel! Now that my kids are teens, it’s payback time! I have them clean the bathrooms and they are officially doing their own laundry! My daughter is still in shock about that one! Corina, I am so glad that I am NOT alone! Yep, my son is in for a big surprise. 🙂 Now go to the ICTIONARY and leave your word(s)! Gagulous – I love it! I think that fits many situations in life ;-). I hate cleaning the bathroom – well, I hate cleaning the toilet, specifically. I think investing in those cleaning wands are totally worth it. I don’t want my hand going anywhere near the toilet bowl! OMG, toilets. Sorry, can’t help you there! I use cloth diapers and reusable rags for cleaning but when it comes to toilets I am all about disposable toilet brushes! Ha! HAHA! I don’t like cleaning the bathroom either, but I also can’t stand it being dirty, so I try to clean it before it gets unbearable. These are funny. I don’t have any words to share though.